Several weeks ago I was sitting in the worship service when two children got up to read scripture with the Children’s Minister. It was so nice to see children participate in a regular worship service. As many of you know, children have a special place in my heart and any time they are a part of worship, I think their divine hearts add to the spirit and love of what makes worship, worship. It was sweet and a blessing to hear them read. Unfortunately, another voice went through my mind: a voice that said in the middle of a deacon’s meeting, “The children’s sermons are dumbing down the worship service.” The person sitting next to this individual was the one who led the children’s sermons in worship. Yes, that would be me. Nobody said a word and when I realized that nobody was going to, I chimed in ever so quietly to remind them all that I was sitting right there, “Well thanks, (his name).” Again, nothing was said. Sadly, the words, the silence, and the experience swarmed through my mind during the rest of the service. I kept going back to a time that was extremely painful for me, when I was alone and when worship was no longer worship. It was a scripted play that I acted in and the directors kept yelling at me to get the lines right. The angelic voices of those children I heard earlier were silenced in the midst of the memories. After worship I went to a place I hadn’t been in a long time, the labyrinth on the campus of Union Theological Seminary. It’s a pathway to meditation, mindfulness, and spiritual freedom. 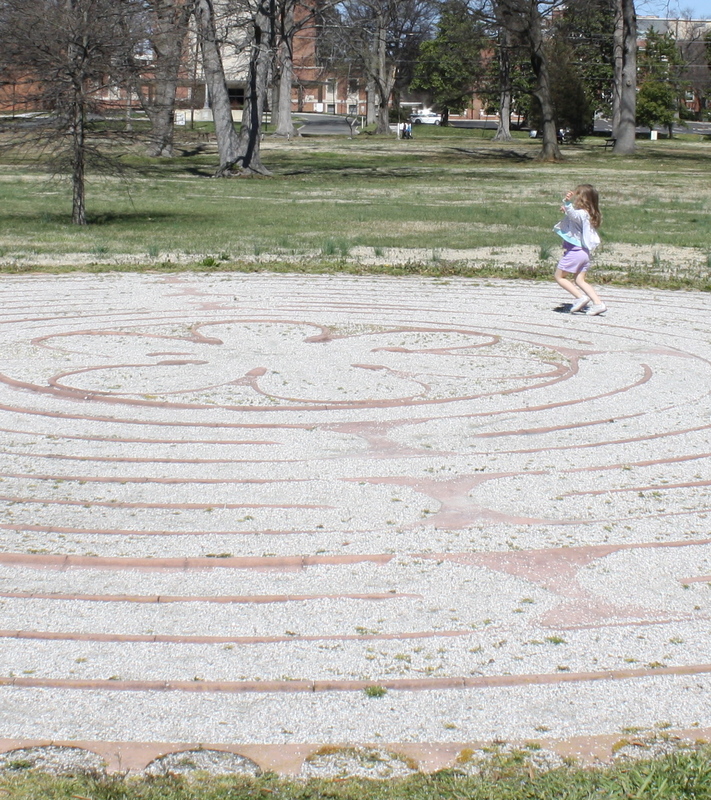 I was hoping to find time for quiet reflection as I walked into the labyrinth to search for the center. It was meant for an opportunity to let go, forgive and learn from the past. 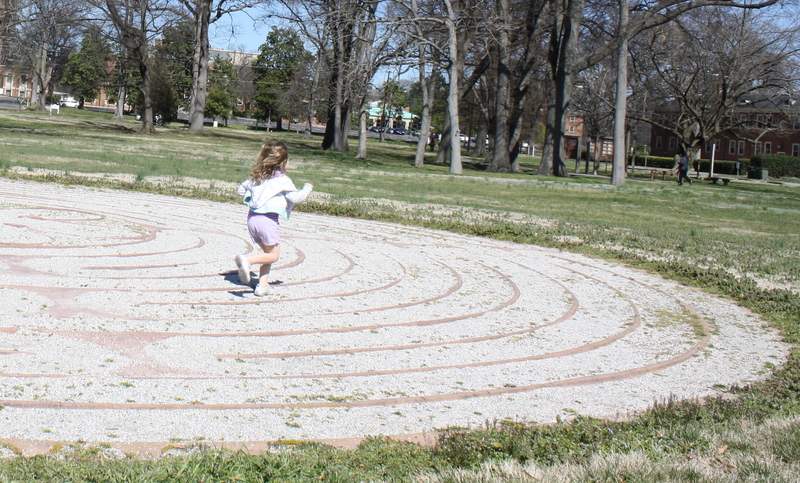 Coming out of the labyrinth, I could reflect and prepare for a better future, a closer relationship with God and a closer relationship with myself, remembering the truth about who I am and walk towards who God wants me to be. Well, that did not happen – at least it didn’t happen the way I anticipated. 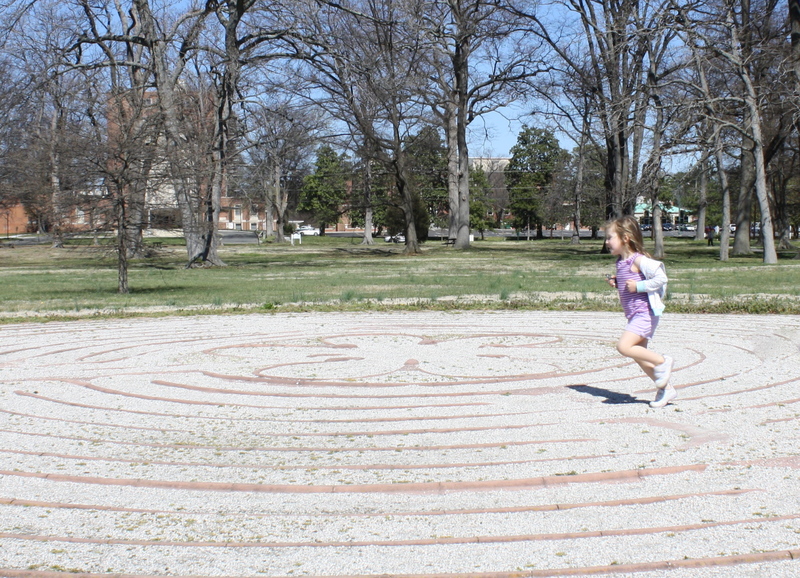 I began my meditative journey into the labyrinth and was a quarter of the way in, when I heard a distant voice say, “There she goes.” The next thing I know, a 4-year-old girl entered the labyrinth and started dancing around. At first, I tried to ignore the disturbance and keep my focus on God. But I couldn’t do it and realized I wasn’t supposed to. God’s focus was on me and God needed to communicate with me in a way I could understand on this particular day. This moment wasn’t a disturbance at all. This was a joyous and exuberant way for God to speak to me. This precious child danced with abandon and made her way through her journey and into mine. Her parents apologized several times for “disrupting” me and I said, “Are you kidding? This is what my prayer is meant to be about today. This is wonderful!” I stood with tears in my eyes and said, “This is exactly what the labyrinth journey is supposed to be about.” I watched this angel dance, meditate, laugh, pray, run, sing, and scream her way into God’s heart, and mine. She followed the path and crossed over the curves. She sat down in the center and contemplated. She jumped up and skipped her way back into the world, only to start all over again. After the family left, despite the child’s efforts to stay, I sat down for a few minutes to reflect on what happened. I thanked God for sending that child my way and reminding me of what is truly important. There are plenty of voices in this world that will do what they can to bring you down, no matter how wrong they are. There is also a voice within you, one made in the image of God, which knows exactly what you are capable of doing. Above all else, allow that voice to be the one you listen to. Allow her voice to dance into your path and remind you of who you are, even if it is during a worship service. Because more than likely, that will be the message God wants you to hear. Maybe the people in the deacon’s meeting will hear that child’s voice too. I pray that some day, they will. This entry was posted in Uncategorized and tagged children, dance, God, jesus, labyrinth, meditation, memory, prayer, scripture, spirit, worship. Bookmark the permalink. Beautiful. Thank you for sharing this – it is truly what I needed to hear. Thanks for sharing God’s light.